Lacoste Live, a new younger clothing line by the crocodile brand, has collaborated with French graffiti artist Honet on a range of clothing. The line-up includes both t-shirts, longsleeve t-shirts and of course the iconic polo shirt. 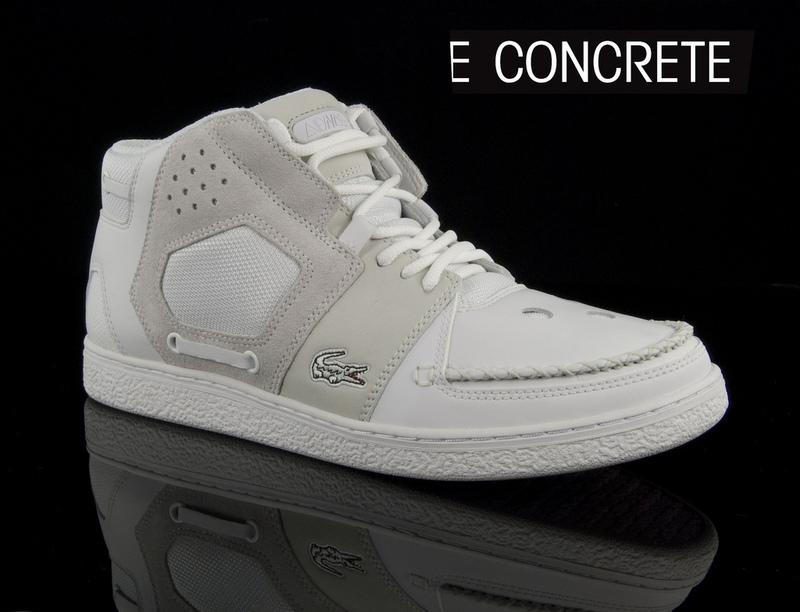 Available now at Concrete. The Lacoste x Li Xiaofeng limited edition polo will be available as a polo for men and women printed with a pattern similar as the pic above. Collar and cuffs will be blue to match the shade in the porcelain and the crocodile logo will be white. Li Xiaofeng will first produce a porcelain plate with the Lacoste logo; he will then break this into fragments and reassemble upside down (a Chinese habit for good luck is to invert characters and images, especially on doorways to homes and temples) After that he will create a ‘Porcelain Polo and sculpture from colourful shards, with red, green and tints of gold, all from the Ming Dynasty. A print of this will be used on a polo for both men and women, with the collar and cuffs printed. No additional logo would be required as it is printed from the original. Li Xiaofeng was born in Hubei, China in 1965. He studied mural painting at the Central Academy of Fine Arts in Beijing, where he now lives and works. He began exploring sculpture as his preferred art medium by using shards of Ming Dynasty porcelain to piece together classical Chinese garments. 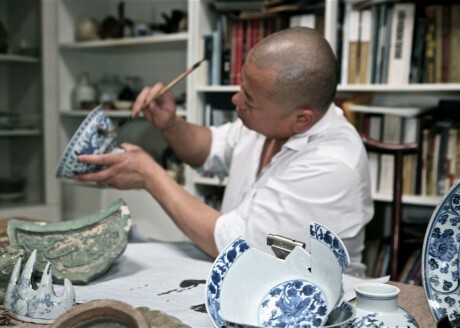 He sources the fragments from a small village in the porcelain center of China, buying them by the kilo and then painstakingly assembling them piece by piece, cutting them into puzzle piece shapes that are threaded together with wire or in some cases knotted string. Like suits of armor, these heavy pieces of art can be worn. 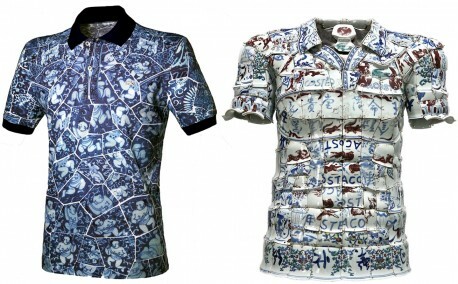 The polo shirt will be available at the Concrete Image Store, Amsterdam soon!! We had a bit of delay! But they’re finally here! Paying homage to René Lacoste and the iconic L.12.12 polo, Lacoste invited 12 collaborators to re-interpret a Lacoste shoe. Collaborators have been pulled from diverse disciplines such as music, art, fashion and even retail and media. Quantities are small as usual, so don’t wait on these babies. Instore at CONCRETE Image Store, Amsterdam, NOW! Click through to see which we still have available! With the twelfth only being two days away, Concrete thought it be a good idea to give you an insight in the inspiration and design of one of the collaborators. For today we have for you: Bodega’s founder, who created a masterful version of Lacoste’s Broadwick – a court-inspired tennis cup shoe, and one of our most coveted styles. On the uppers, the Bodega design features a sophisticated woolen pin stripe in deep navy. Contrasting this rich tone, the tan leather trims around the heel tab, collar and lining give an overall feeling of refined styling and clean-cut elegance. 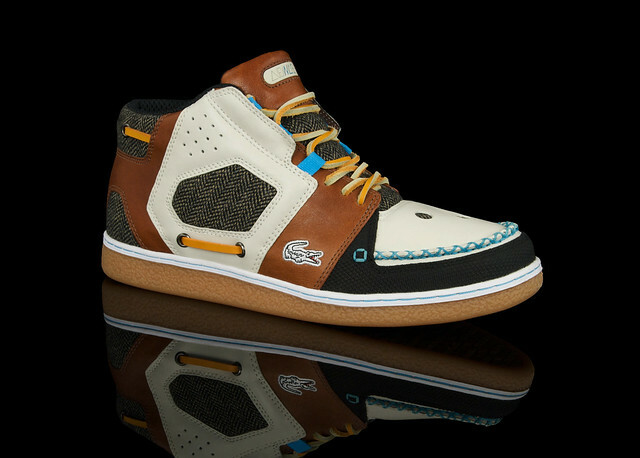 Bodega’s signature is embroidered on the heel. Founder of the cult Boston sneaker store, Jay Gordon, talks about his design for Lacoste Legends collaboration project and his love of the brand below. 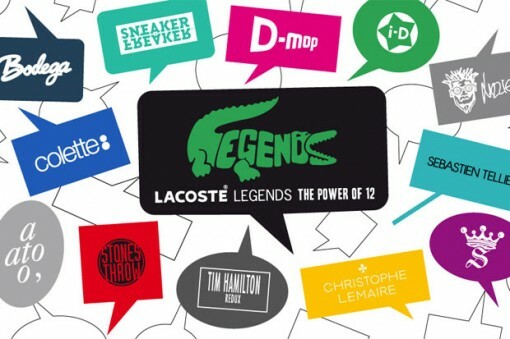 This year on the twelfth of the twelfth, Lacoste will release their youngest limited collection in selected shops around the globe including Concrete Image Store in Amsterdam, paying homage to René Lacoste and the iconic L.12.12 polo, Lacoste invited 12 collaborators to re-interpret a Lacoste shoe. Collaborators have been pulled from diverse disciplines such as music, art, fashion and even retail and media. Check the slideshow to see which of these we will have stocked. Quantities are small as usual, so don’t wait on these babies. Release will be the twelfth of december. Making his mark in the world of custom footwear, Nash Money’s talents have seen him catch the eye of larger footwear companies. From previous collaborations with DC SHOES, Nash Money embarks on a new collection with Lacoste on a completely new Bravington model. The shoe’s design brings together a boating heritage with Nash Money’s own personal design language including hidden laces, big perforation details and a moccasin cross-stitch. Available now at Concrete. 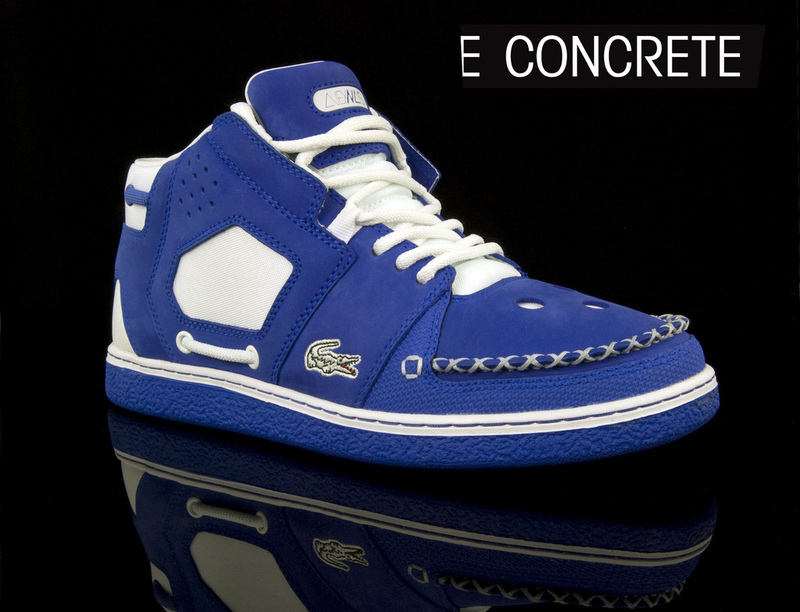 Lacoste teams up with sneaker customizer Alex Nash a.k.a. Nash Money, to create a brand new silhouette the Bravington, which will be released in four fresh colourways. Nash was inspired by the suave and sophisticated heritage of LACOSTE and wanted to create something that stayed faithful to this design ethos of the brand.The result is an unmistakably Lacoste shoe that is imbued with Nash identity. Drawing inspiration from the brand’s heritage in yachting, this all-new high-top blends classic Lacoste characteristics with signature Nash design elements including a moccasin cross stitch, hidden laces and fat perforations in the leather. White and blue versions launch NOW and with two more designs to be unveiled in November.